Aisling “Ais the Bash” Daly Interview Aisling “Ais the Bash” Daly is an undefeated MMA superstar training out of Straight Blast Gym Ireland. 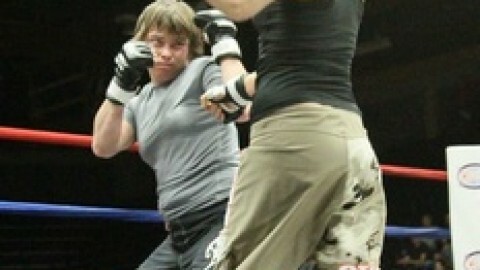 Widely regarded as Ireland’s top female fighter, Aisling Daly holds a professional MMA record of 5 wins and no losses. 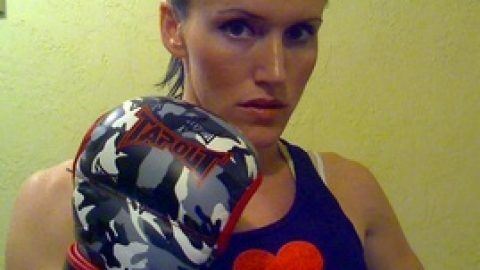 Fighting at 125 lbs., 20-yr old Daly began her pro mixed martial arts career in September 2007. She has won each of her fights by submission or knockout. Q: For our American readers, how do you pronounce your name? A: My name is actually an Irish name, Aisling, but the Ais is pronounced exactly the same as Ash which can confuse a lot of people. They think it’s strange because it doesn’t rhyme when it really does. Q: How did you get your nickname? A: I got my nickname “Ais the Bash” from my childhood karate days when I was about 10 years old. We had points sparring and semi-contact sparring competitions and I’d beat up the other girls and guys my age. I suppose it was catchy and has been with me ever since. Q: When did you start training in martial arts? Who did you train under and in which styles? A: I started training in martial arts when I was about 10 years of age doing Kenpo karate. When I was about 14 my karate instructor at the time, Ian Ward, started introducing me to a new style he was learning called BJJ. I loved it from the minute I saw it. It was so much more fun and energetic than what I had been doing and it was effective too. A short time later I left Kenpo behind and began BJJ/MMA style training with Ian once or twice a week. In 2006, I went to a Matt Thornton seminar where I was given my blue belt in BJJ. It was at this point that Ian decided he couldn’t help me anymore and I’d have to train with someone who had more experience if I wanted to get better. Later that year, I began training BJJ/MMA with John Kavanagh in Straight Blast Gym International (SBGi) and Muay Thai with Paddy Clint. Ian now trains alongside me in SBGi. Paddy is a very traditional Thai coach so it’s up to John to mould everything together to work in the cage and get me fight fit. John puts an immense amount of time into me and is the most important part of my team. I received my purple belt in February of this year. Q. When did you switch to SBGi? How is their training philosophy different? A: When I was training with Ian he himself was being coached by John Kavanagh of SBGi so I suppose I was always exposed to their training methods. SBGi is all about aliveness, a system in which techniques are practiced against non co-operating opponents to show their real effectiveness, focusing on drilling fundamentals in all ranges to ensure everyone has a solid base to develop their own game from. The gyms are not run with rituals or politics, everyone feels welcome and it’s all about training hard and enjoying it. Q: How often do you train? What does your training look like? A: When I don’t have a fight coming up I’m in the gym pretty much every day anyway except Sundays. When I do have a fight coming up I’m, in the gym twice a day most days working on cardio and conditioning in the mornings, MMA sparring and fight specific endurance drills. Training varies on different days depending on which classes are on. Some evenings it’s pure BJJ, others day boxing or MMA. Coming up to a fight all the classes become focused on whatever type of game plan I’m working on. John keeps me on my toes and he’s developed some sickening drills to keep me in shape. One in particular involving me being dragged around the gym on a harness. He enjoys making me suffer. Q. Are there any girls at your gym? A: There are no girls at my gym who train MMA unfortunately, so sometimes it can bit a lonely. But the guys are great and make me feel right at home training with them. We have a lot of fun together and have become good friends. Q:So do you tap out all the guys in your gym? How do they react? A: I definitely don’t tap every guy in the gym. We have some really high level guys who are very technical and a lot bigger than me, so not everyone. Most of the guys in the gym are great to roll with and have no problems with you tapping them out. They give me a lot of respect as an athlete and don’t make any distinction because I’m a woman. That’s not to say there haven’t been guys who go crazy because I’ve tapped them, but those kinda guys usually either just get over it and keep training or they leave because they have an ego problem they can’t control. Being disrespectful to training partners of any gender wouldn’t be accepted in the gym anyway, really. Q: You’ve trained Thai boxing under Paddy Clint and BJJ/MMA under John Kavanagh. Any good training stories you’d like to share? A: The most interesting training would be how John reacted to me when I first turned up at the gym and wanted to train MMA. At the time I didn’t realize it, but he didn’t take me seriously at all. He thought I’d train a little short term, realize MMA was too hard and then go away. I remember he’d set me tasks to complete. John would say, “If you do this I’ll let you fight.” He thought I’d give up and just leave it but I didn’t. I did everything he asked and then he was left with no choice. I had a couple of amateur fights and really impressed him. He changed his mind after that and hasn’t looked back since. Now I’m one of his best athletes. Q:What kind of things did he have you do? A: John would set me little tasks, like I’d have to attend a certain amount of classes a week or improve a certain skill. Like, my stand up was pretty terrible when I started, as was my wrestling, but I put the work in and achieved the standard to fight. Q: Do you have any advice for women just getting started in training? A: The best advice I could give is find a gym where the people are friendly and will help you along. As a woman, there will always be guys telling you that you can’t or shouldn’t be training or fighting, but just ignore them. Don’t have an ego yourself, either. If some big guys tries to beat you up, just leave it, it’s not worth the injury to prove a useless point. Know your own mind and once you know what you want don’t stop going until you get it. Q: What was your toughest fight? A: My toughest fight so far would definitely have to be the Majanka Lathouwers fight. That girl was tough and strong very technical in all ranges. It was somewhat of a war. I was so pleased to be fighting her. I had known about her beforehand and wanted a fight with her. 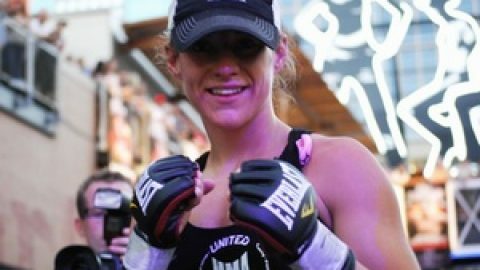 She’s about the same age as me and I knew she was a solid fighter would had taken Marloes Coenen to the second round. Majanka is one of the best in Europe. I was so happy with that win. I’m not sure if there’s much left for me in Europe now, so I want to take on the world. Q: Who would you like to fight? A: I’d really like to fight Megumi Fujii She’s definitely one of the top in the world around my weight, I think she’d be a great test for me, let me know exactly where I stand in the world on my quest to be the best. Q: What’s with the 3 minute rounds for girls? A: I think the idea of 3 minutes rounds are a bit ridiculous being honest. There is no logical reason why females should have to fight 3 minute rounds. We are just as capable as the men are to fight 5 minutes round; we deserve the same amount of time to showcase our skills. I really hope Elite XC does something about that. I can’t see the fans complaining since all the women’s fights so far have been awesome to watch. Q: Looking at your fight history sometimes your fights are only two or three months apart. Do you just recover really quickly because you’re young, or is it because you’ve never really taken much of a beating? A: It’s probably a little bit of both. My first few fights lasted a lot longer and I did take some shots, but after a week or two I was back to normal and ready to go again. My last few fights have been quick finishes for me, physically I’d be fine but I think the most important thing is to give your head a rest after a fight. There’s nothing more mentally exhausting and stressful than preparing for a fight. I personally really need to relax for a little bit before I can go again. I really love fighting and will pretty much take any opportunity that comes up, so if there’s anyone out there looking to fight me, I’d love to. It’ll be fun. Q: Any tips for maintenance and recovery? A: I can’t stress enough how important sleep is. I would never survive the amount of training I do without sleep. Napping in particular sometimes after a morning session when I feel like death and wonder to myself, “how am I supposed to train again later?” I eat some good high protein food and then take a little nap and I’m fired up and ready to go again. Also, take some time to do some non-training stuff when you can; watch a movie with friends or just hang out. That gives you’re head a break too, because if you’re anything like me you’ll have replayed the fight in your head and analyzed your opponent until you’re so sick of doing it. Q: You put college on hold to pursue your fighting career. Are your parents supportive? A: I finished two years of a three-year English and History degree and then decided to leave it for a while and focus on fighting. I’m young so I can always go back to education; fighting is more of immediate thing and the younger you are getting started the longer you have to improve and develop your skills. My parents are really supportive; I still live at home with them and they make sure I’m looked after really well. They joke that I used to be a broke student and now I’m a broke fighter. My mother says when I’m rich she’s going to give me a bill for all I owe her over the last few years. Q: Is fighting your full-time job? If not, what other work do you do? A: Fighting is pretty much my full time job. I have a small part time job in a shoe shop but that’s only a couple of hours a week. That’s more just to give me money to do things I want to and to give me another outlet other than being in the gym all the time. Besides, I really love shoes and because I work there I get a nice little discount. Q: What are your other hobbies? A: Other than fighting, I like to do pretty much normal things. I like hanging out with my friends, going out dancing, shopping, reading, listening to music, watching TV. I’m pretty boring, I think. Training takes up a lot of time so I suppose there’s no time for any other major hobbies. Q: Who are your favorite fighters? A: My favorite male fighters would have to be George St. Pierre and Anderson Silva. I love GSP’s athleticism and fighting style. I also like his attitude to the whole game like taking a loss and coming back stronger. Silva is such an amazing fighter. He’s so calm and then he’s like dynamite. His striking is so accurate; it’s awesome to watch and impresses me every time. I like his attitude as well. He’s always humble and very grateful to be where he is today. I have a lot of favorite female fighters, for different reasons. I like Megumi Fujii’s exciting submission style. It’s very entertaining to watch. I like the way Tara LaRosa built herself up and beat everyone Bodog put in front of her. I think Rosi Sexton is great role model for anyone getting into the sport. She works hard and finds time to do amazing things. I have a lot of respect for her and she’s also a fellow SBGi member; her coach Karl Tanswell has helped corner me at fights and I really appreciate his help. Q: Can you tell us about your fight against Tara Larosa? A: I had a grappling match with Tara Larosa at the FILA world grappling championships of last year. That was a lot of fun and a close match. I had some good submissions attempts. She never really tried anything. She passed my guard at one stage of the match and that was it, really. She won on points. I really feel like I’ve improved so much since then. I’d love to have another match with her. I think the outcome would be different. I’d even love to fight her in MMA. I think it would be a great fight and definitely one I wouldn’t say no to. Q: What do you think are the biggest challenges for women fighters? What do you see as the future of women’s MMA? A: I think the biggest challenges to women fighters is the industry itself. Although it’s improving greatly at the minute I don’t there’s enough acceptance of FeMMA yet. I think it’s still viewed as being some sort of novelty. All we can do is just plug away, work hard and keep putting on great fights that people want to watch. Organizations like Elite XC who are putting on female fights at such a high profile are the way forward; that’s the only way we’ll get to showcase our skills on the world wide stage. It’s hard but by being good ambassadors for the sport and showing FeMMA in a positive light, things will eventually change. Things just take time.